Then I began the brushing process. Since my last photo of the brushes I will be using, I had found another couple of brushes --- a 2" Taklon brush and a fan brush. I saw the fan brush and thought that it might help to feather out any streaks or bubbles that might occur as I brushed. As I brushed on my first coat of the EM6000 today, it turns out I was right! The brush I ended up primarily using was the big white round brush (it seemed to lay on the finish the most smoothly). If I had any streaking or dripping, I simply went over it with the fan brush, and that smoothed it all out. It's about 4:30 p.m. right now. I will probably do at least two more coats today. I first applied finish to the sides. Then I worked on the back. I let it sit (the top to the workbench) for around 30 minutes, until it was dry enough to lay on its back. Then I brushed the finish on the top. I then hung the guitar with a wire hanger to a hook I have on the bottom of my workroom shelf. No photos today, because there wouldn't be much you could really tell from them. All I've been doing is laying on more coats of the EM6000 finish. Friday, I had applied the first 3 coats. Saturday, I decided to try out adding a little SA5 retarder to the EM6000; I added about 10% retarder. I first lightly scuffed the 3rd coat from the previous day, before applying 4 more coats. As I previously explained, I would apply finish to the sides, then the back, wait at least 30 minutes for those coats to dry, before applying the finish to the top. I would then wait at least 30 minutes before repeating the process. The retarder did help to make the coats flow on a bit more smoothly, so I'm glad I decided to do that. This afternoon, I level-sanded with 320 and 400 grit sandpaper. 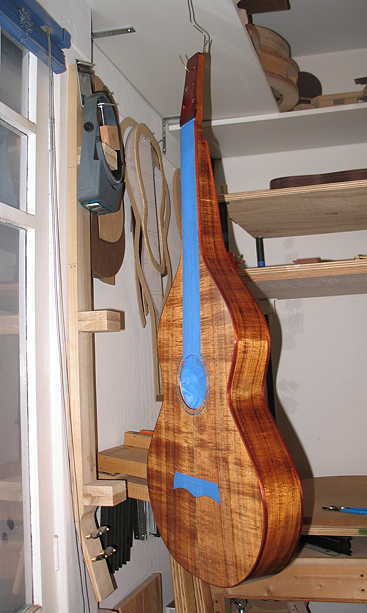 So, right now, I have the 8th coat applied to the sides and back, and am waiting to do the top. The finish level-sanded pretty easily, so I'm not sure yet exactly how many total coats I'll end up doing. I might go up to 12 coats, do another level-sanding, and see how that goes. LATER THAT DAY . . . I have applied a total of 10 coats now. I applied a total of 4 coats today, making a total of 14 coats so far. Tomorrow, I will do another level-sanding and will see whether it's good. I level-sanded the 14th coat with 400-grit gold sandpaper; I think I'm about done. The finish sanded beautifully, and I didn't sand through anywhere! I plan to put on just a couple more coats. The weather has improved, so I put regular-strength EM6000 (no retarder) into a Pre-val sprayer and took the guitar outside to spray (it's sunny and clear outside, about 63 degrees --- yesterday, it was a little rainy and cold, but it's cleared up nicely today). So far I have sprayed the first full-strength coat with the Pre-val. I just discovered how to unclog the sprayer when it starts spitting and clogging --- you just stick your finger over the nozzle hole and spray --- that forces the air down the intake tube and unclogs it! Duh! I never knew that before. (Shows how much I know.) Anyway, even though it's still a little bit cold outside, I have been able to spray the finish, allowing the last couple of coats to lay on smoothly and level out nicely! LATER (about 3:00 p.m.) . . . I am finished with the finish!!! I ended up putting on three more light coats. Now I will have to let it sit for a week, before I do the final rub-out and setting up. This is the hard part.